It constitutes main bag, accessory bag and front bag. Highlight: We adopt tide design to make you unique. 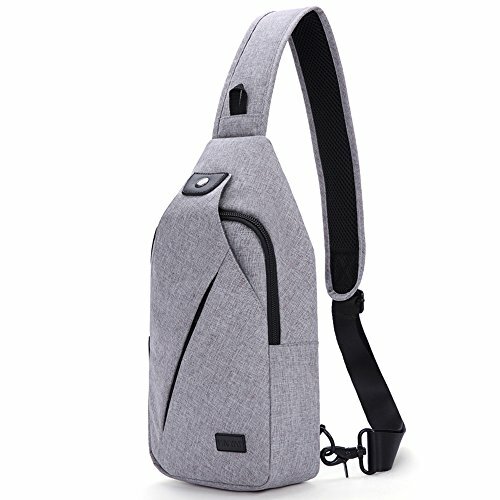 The product has three colors to choose such as black, grey and white-grey. You can choose the best suitable bag for yourself according to your needs. Strip: It is a personalized strip, so you can adjust right or left and collocate your clothes in a fashionable way and go out in a relax way. Washing tank: You need to wash it with clean water and must remember that you are not permitted to use washing machine. Tenet : It is our tenet to take a bag ,enjoy a different bag, and possess freedom and free style. 1. HIGHT-QUALITY: Waterproof and Scratchproof. It is characterized with high strength fastener, durable metal buckle and personalized magnet hook. 2. HIGHT-CAPACITY: It has three bags, including main bag, accessory pack and front bag. Your umbrella, wallet and phone card are easily loaded. 3. BREATHABILITY And LIGHTNESS: Lightness with light fabric, washable, wear-resistance, environmental protection and fungi-proof. Its brace is breathable and loose. 5. UNPARALLELED CUSTOMER SERVICE: We sincerely serve you and guarantee that if you encounter quality problems, we will change a new product for you without pay. If you have any questions about this product by Hikpacker, contact us by completing and submitting the form below. If you are looking for a specif part number, please include it with your message.